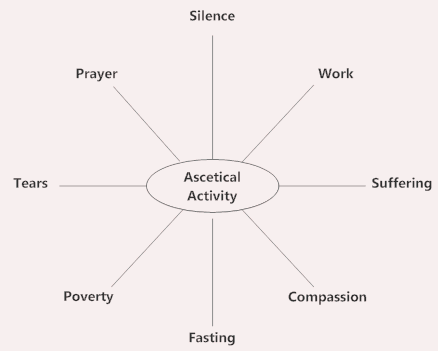 Asceticial activity replaces passionate activity, quieting the heart and allowing it to become prayerful, permitting to soul to mount the cross. Subduing passions, the temple of the soul becomes pure, inviting God to inhabit it. Through fasting, gluttony, which is self-indulgence, is cured. The discipline of chastity, a form of fasting, brings about viringity. When compassion overtakes one's pragmatic ability, the heart expands and fulled with a profound urgency in prayer. God commanded that Adam and Eve and should labor, for having been robbed of Pardise, and become impoverishedc, it is only by obediently struggling is the attitude of rebellious pride overcome.